I’ve been at the dotMOM Conference in Birmingham all weekend, and so this is definitely a week of meal planning where I am glad (and so grateful) to have a full pantry and freezer that I can quickly plan this week’s dinners. 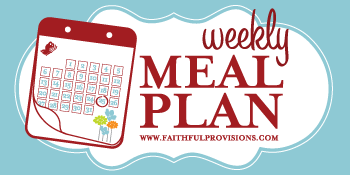 If you’re already feeling a little overwhelmed by new fall schedules, let me encourage you to get back to the basics of meal planning. Just as my daughter’s soccer team is re-learning the basics of soccer, it’s important for us to sometimes go back and re-learn the basics of grocery savings. Meal planning is crucial to saving money each and every week. I can get off track too, and when that happens, I know it’s best to go right back to the foundations that I first learned when my friend Bekah was mentoring me. :: Check out the articles and tools on this Meal Planning page to get started, or to pick up wherever you left off! Sunday: We’re having breakfast for dinner tonight with a Ham and Cheese Quiche that I’ve had in the freezer and simply toast and jelly on the side. Monday: I haven’t done my Beef and Broccoli Stir Fry in a while. Broccoli is in season and on sale, so it’s a great time to have some fresh meals and salads with it. Easy egg rolls and a green salad will go perfectly with this. Thursday: Grilled Tilapia and Sweet Potato Fries Sweet potatoes are coming in right now in gardens all around me. If you want to know how to get them ready for the freezer, plus find some great recipes, check out the Sweet Potato Recipe Exchange HERE. *Top with whatever is left in fridge, my new favorite is fresh chopped spinach, sliced tomatoes, green olives, pepperoncinis, and artichokes. LOVE, LOVE, LOVE your site! Tired of making up my own meal plans for a while and going to totally just follow you and use yours..AND I love the recipe shopping list thingy! It was so nice to have met you at dotMOM! You are a great inspiration! Blessiings to you and your family! Shari – You are so encouraging! It was great to meet you too! !